The Manual Carwash is closed until further notice. We apologize for the inconvenience and thank you for your understanding. Questions or concerns can be directed to the Outdoor Recreation Manager at 321-494-2042. FAMCAMP SUMMER HOST POSITION AVAILABLE! May 1 thru Oct 31, 2019. Payment in-kind for campground site. Please contact 321-494-9691. Single Airmen - we'd like to hear from you! Stop by and let us know what kind of programming and equipment you would like to see here at Outdoor Rec. 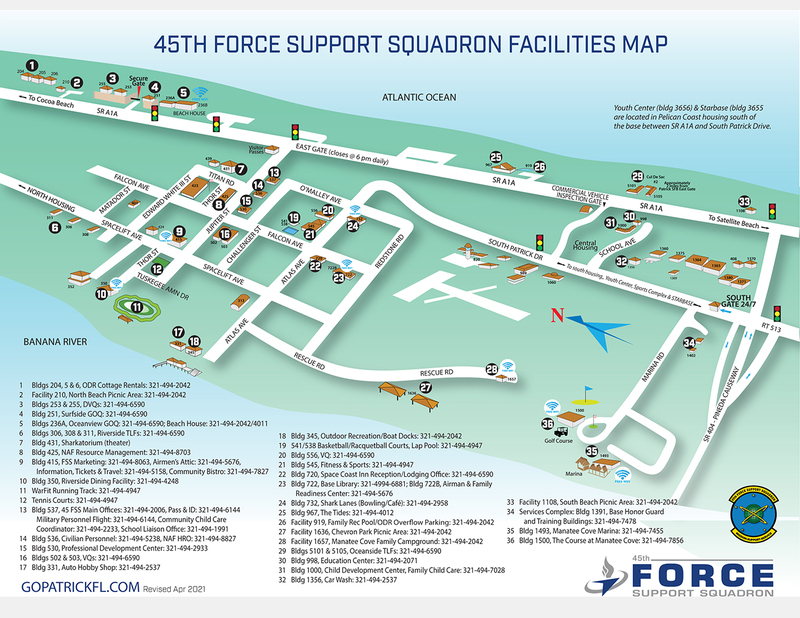 Per Air Force guidelines these programs are targeted for active duty personnel and their family members from all branches of Service. Others may participate on a space available basis and are not eligible for the program discount. Register at Outdoor Recreation no later than 1 week prior to event. Thursdays 6:30 - 8:30 am. Kayak or stand-up paddleboard activities. Fridays 6:30 - 8:30 am. Field games taken to the extreme. 27: BREVARD ZOO ADVENTURE, Deployed Affected Program (DAP) Activity fees apply. 8:30 am - 5 pm. Register no later than Apr 22. 2: SUNSET PADDLE OUT: Free, 5:30 - 7:30 pm. Choose a standup paddleboard or kayak. All equipment included. Register NLT Sun prior to class. 11: TANDEM SKYDIVE KSC: 8:45 am. $30 for Single Airmen Program participants. 4-hour safety, equipment and ground training cours; a 2-minute free-fall @ 18,000 ft. and a 6-minute parachute ride. 17 - 19: RAFT AND ZIP ADVENTURE WEEKEND: $45 for RecOn participants. White water rafting on Chattahoochee river - class 3 and 4 rapids. Zip-line adventure course and camp overnight in Columbus, GA.
24: SURFING LESSONS: RecOn program; 1-hour class at Cocoa Beach; must be at least 5 yrs. old; children up to and including 15 yrs. old must be accompanied by a parent or legal guardian. Learn fundamentals or develop your skills. 6: SUNSET PADDLE OUT: Free, 7:45 - 9 pm. Choose a standup paddleboard or kayak. All equipment included. Register NLT Sun prior to class. 8: TANDEM SKYDIVE KSC: 8:45 am. $30 for Single Airmen Program participants. 4-hour safety, equipment and ground training cours; a 2-minute free-fall @ 18,000 ft. and a 6-minute parachute ride. 15: DISCOVER SALTWATER FISHING: 10 am - 1 pm. Special locations around base selected for each class. Register NLT 5 pm the Friday prior to class date. 26: SURFING LESSONS: RecOn program; 1-hour class at Cocoa Beach; must be at least 5 yrs. old; children up to and including 15 yrs. old must be accompanied by a parent or legal guardian. Learn fundamentals or develop your skills. 27: SUNSET PADDLE OUT: Free, 7:45 - 9 pm. Choose a standup paddleboard or kayak. All equipment included. Register NLT Sun prior to class. 29: BIOLUMINESCENT MOONLIGHT KAYAK TOUR: 7:30 pm. RecOn program; Experience this natural glow with every paddle stroke. ODR has complimentary 24-hour lawn equipment available for Active Duty and Active Duty Reservists who reside on PAFB. Must show ID. Also, ODR offers on-site complimentary use of Mobi chairs at the riverfront rental facility and the oceanfront Beach House facility. Please call ahead to reserve this equipment. (Must provide proof of disability). Rent a bike thru us or use your own, but be sure to use your log to record the trails explored and photos taken at select destination spots to earn your rewards!